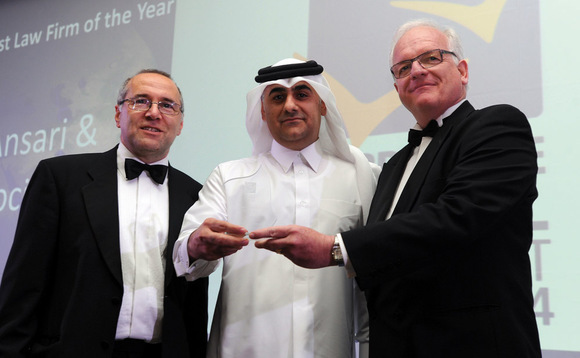 On March 31, 2015 Al-Ansari & Associates won the coveted M&A Atlas Award during Gala Ceremony of the 7th Annual Global Major Markets Awards held at the Intrepid Sea & Air Space Museum in New York City, winning the award for Middle East M&A Deal of the Year 2015 for its work on Labregah Real Estate acquisition of Barwa Commercial Avenue, Barwa City and the sale of a stake in Barwa Bank. Competing deals included Emirates Telecommunications acquisition of Maroc Telecom from Vivendi and Energy Investments Global, and the subsidiary of Al Mirqab Capital acquisition of Heritage Oil. Our Associate, Shaan Lodi received the award on behalf of Al-Ansari & Associates. Mohammed Al-Ansari, the Our Founder and Managing Partner, said "winning the award at the beginning of 2015 will encourage our team to excel and our clients to get the maximum out of our services." For Announcements, please visit: M&A Atlas Awards: The Winners.